During the past four months I received many examples of hospitality and generosity from Argentinean and Chilean friends. In order to share these great experiences with you and to indicate where we can learn from Latin America I have prepared a little blog. When driving to Piedra Paradas for rock climbing I gave a ride to a hitch-hiker who travelled the same direction. He introduced me to his friends who immediately incorporated me in their group. Although they were much better climbers than me they enabled me to climb with them for a whole week. Every morning/evening we cooked together and everybody chopped in whatever food he or she had. In comparison: In my home country every couple or even every person would prepare a meal for him/herself. When paragliding in Santiago a pilot gave me the addresses of several pilots in Mendoza and in addition called them to announce my arrival. The Mendoza pilots managed to get a camping ground reopened (that due to end of season was already closed) with me being the only guest. They “baby-sitted” me during my flights and at the end even arranged a farewell party for my departure. In Caleta Condor I mounted a boat with seven other people to bring us to a Mapuche reserve. 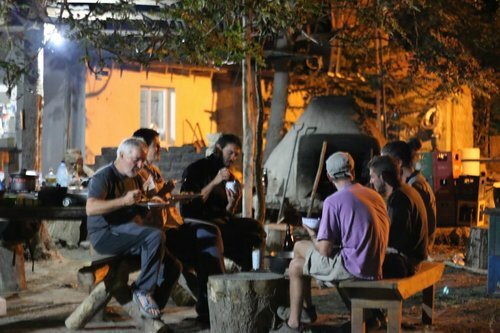 Without discussion we formed a group which spent the next five days together, conducting activities, sharing food, drinks, the four available plates and the two cooking pans…. Friends introduced me to other friends and basically wherever I travel to I already have contacts (special thanks to Fernando, Ines and Macarena). It seems that In Latin America social interaction is much higher than in Central Europe - people are less distanced and more open to make friends. Another remarkable issue is generosity: When a group of people in Austria and Germany is dining in a restaurant usually everybody requests a separate bill per person (which makes waiters champions in mental math). Here in Latin America the group takes the total bill adds the tip and divides the bill by the number of persons, no matter if somebody had a beer less or skipped the desert (it is his/her fault not having consumed more). Among friends you do not calculate…. When working in the countries of the former Yugoslavia I experience a tradition which even went a step further. When you dine out as a group towards the end of the meal one person gets up and secretly pays the bill of the whole group. The art is to get the timing right: one cannot do it too early as people are still ordering more drinks; if you wait too long somebody else has already covered the bill. Of course, next evening another person will be the “faster one” to cover the bill. Somebody who constantly is stingy sooner or later would lose all friends and would not be invited anymore. Seems we Central-europeans can learn quite a lot from other countries.